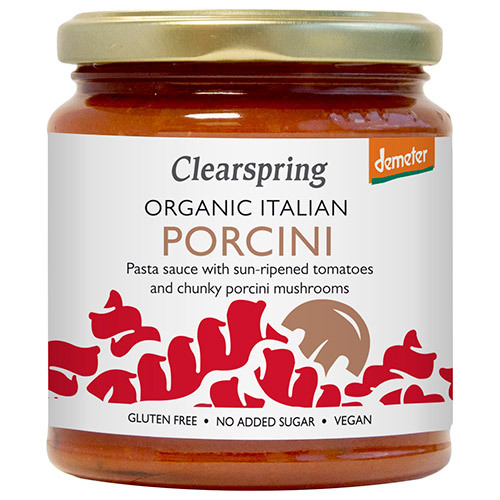 This Porcini mushroom pasta sauce has been produced directly on a farm in Italy since 1990, using freshly harvested 100% Demeter sun-ripened tomatoes. Top quality, fresh organic ingredients guarantee the genuine and homemade flavour. Even the extra virgin olive oil that serves as the base for the recipe is carefully selected from a special Demeter estate. Tomatoes** (91%), extra virgin olive oil**, porcini mushrooms* (1.8%), carrots**, celery**, onions**, sea salt, parsley*, basil*. Once opened keep refrigerated and consume within 3 days. 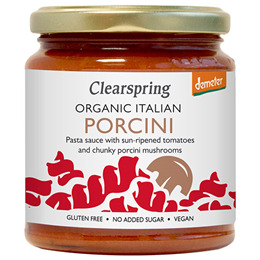 Below are reviews of Clearspring Organic Italian Porcini Pasta Sauce - 300g by bodykind customers. If you have tried this product we'd love to hear what you think so please leave a review.